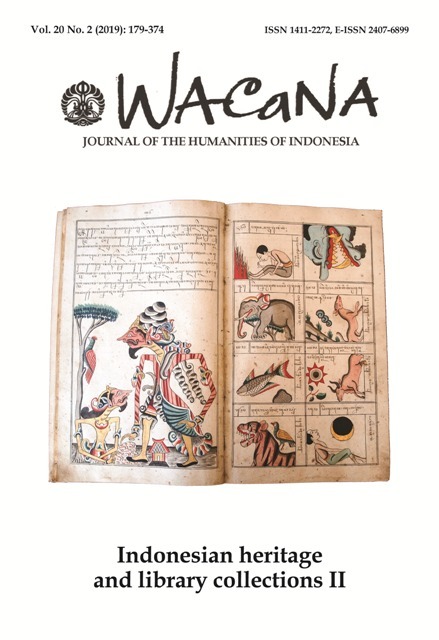 Wacana, Journal of the Humanities of Indonesia is a scholarly journal accredited by Decree of the Directorate General of Research Reinforcement and Development, Ministry of Research, Technology, and Higher Education of the Republic of Indonesia No. 60/E/KPT/2016, 13 November 2016. This journal of the Faculty of Humanities, Universitas Indonesia, is a medium for scholarly discussion, description, and surveys concerning literature, linguistics, archaeology, history, philosophy, library and information studies, religion, art, and interdisciplinary studies. The journal is published twice a year.